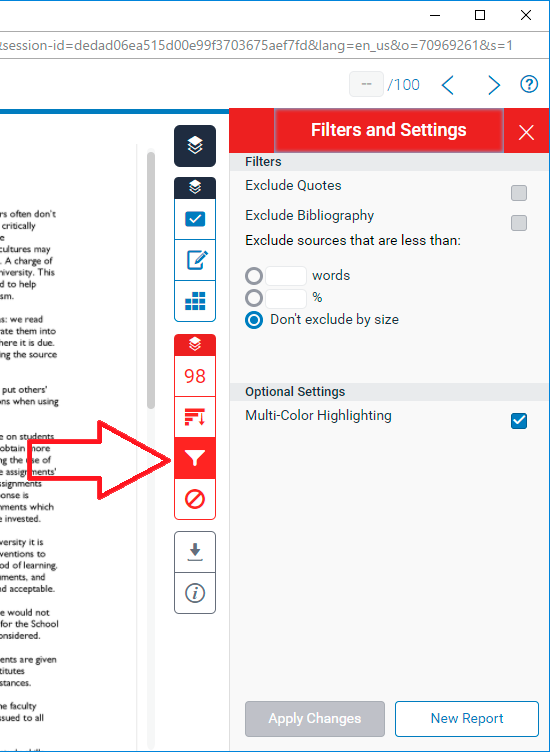 This guide explains how to use filters in a Turnitin Originality Report. 2. 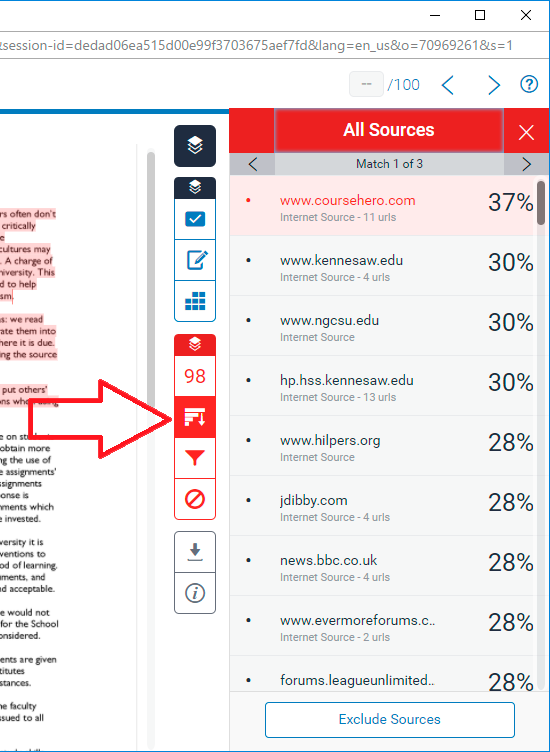 Click on the name of the Turnitin Assignment in which you want to exclude sources. 3. Click on the Originality Score for the report you wish to filter. 4. Having expanded the side panel, click on the filter button in the similarity area of the side panel. 5. Choose the filters you wish to apply, and then click on Apply Changes. 4. You will now be taken to the Feedback Studio interface with the ‘similarity’ layer turned on. This is indicated by the red buttons in the side panel. 5. The first button in the similarity section of the side panel is the ‘match overview’ button. This shows you an overview of all of the matches relating to the submission you are viewing. Clicking on a source on the right hand side will highlight the matching text for that source within the document on the left. 6. The second button down is the ‘All Sources’ and provides a further breakdown of matches. For instance, Paragraph one may have been taken from a specific source online, but may also have been used elsewhere online by someone else. The ‘All Sources’ button will give you a full breakdown of ALL of the sources where the match has been found, rather than just the primary match. This button also allows you to exclude any of the matches shown. 7. The third button allows you to view filters and settings for the similarity layer. For instance if you want to exclude matches below a certain percentage, or under a certain number of words. 8. The final button in the similarity area of the side panel allows you to view excluded sources. Excluded sources are any matches which you have decided not to include in the originality report, for instance if you believe they are correctly referenced, or can be ignored for some other reason. You can also restore matches from this section in the event that you have excluded them by mistake. 1. If your tutor has configured your TurnitinUK assignment to allow students to see originality reports, you should be able to do so shortly after you have submitted your assignment (this may take longer depending on how busy the system is). Enter the course to which you submitted your TurnitinUK assignment and click on the Content Area in which the assignment is located (for example, Assignments). 2. Locate the TurnitinUK Assignment link, which will look similar to the screenshot above, although will have a different name. Click on the link which says View / Complete. 3. Assuming you have already successfully submitted an assignment, you will see a view button, as on the right hand side of the screenshot above. If your tutor has set the assignment up to allow you to see your ‘originality score’, you will see this as a percentage (as highlighted in the screenshot. If you click on this, the document viewer will load in the ‘originality score’ view. 4. 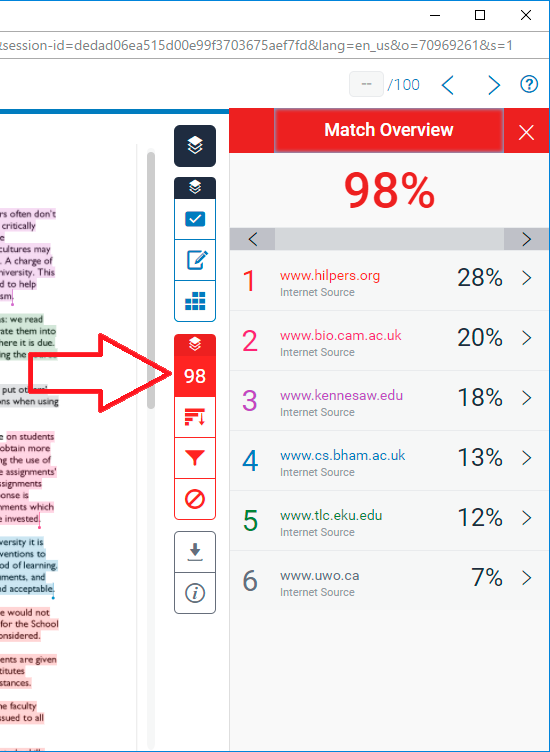 Once you have loaded your originality report, you will see your submission text on the left hand side of the screen, and a list of matches on the right hand side of the screen. 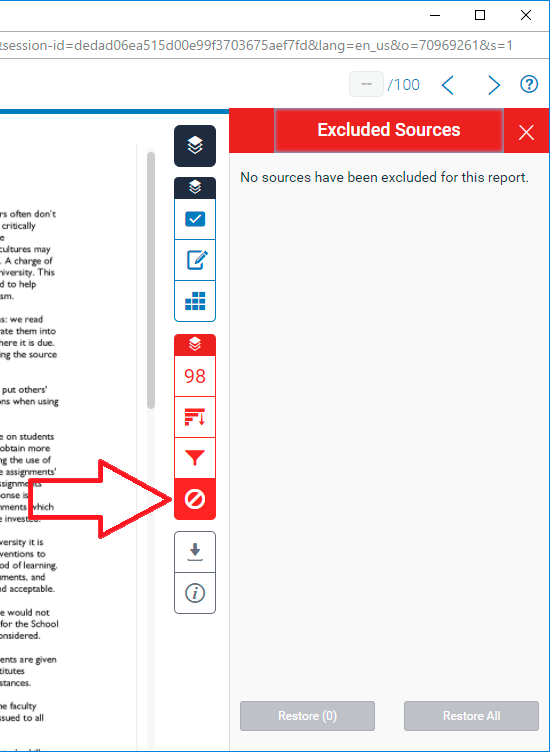 How to exclude sources from a Turnitin Originality Report. 3. Click on the percentage score of the Originality Report in which you want to exclude sources. 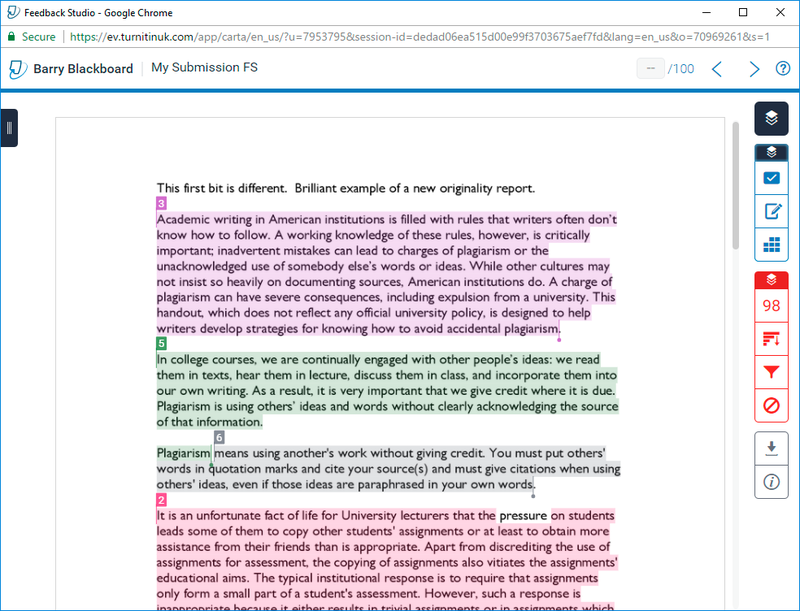 In this example we are choosing a report with a score of 100%. 4. On the right hand side of the page, hover your mouse over the source which you wish to exclude and then click on the Arrow which appears. 5. Click on the Exclude Sources button in the bottom right hand corner of the page. 6. Put a tick next to any sources you wish to exclude from the report, as shown in the screenshot. Once you have done this, click on the big red Exclude button at the bottom of the screen. 7. The Originality Report should automatically refresh and show you a new score, in this case 98% rather than 100%. 4. Click on the filter button in the lower right hand corner of the Originality Report.